System restore is a useful feature provided in windows. Most of us ignore creating restore points and at times also disable this feature to save hard disk space. Creating restore points keeps you on the safe side and helps restoring system to normal state if you make accidental changes. System restore points should be created on regular basis to keep it updated to the latest working point. But many of us keep forgetting it and end up with restoring with an old restore point. Setup Monitor is a freeware application for windows that monitors system changes. These changes are necessarily installation of new application. Using this application is extremely easy and only thing that you have to do is keep it running in background. You can view running processes, view previously created restore points or create new restore points. The main task of this utility is to monitor system to new application installs. Whenever you install a new application it prompts for a system restore. 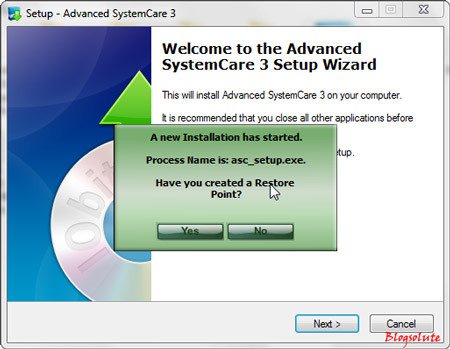 This will basically help you to have the latest system restore point if the installed application corrupts your operating system. More than creating new system point, a user what needs is TO KEEP THE OLD SYSTEM RECOVERY POINT INTACT. BUT WINDOWS XP DOESN’T PROVIDE THAT OPTION! IS THERE ANY WAY TO RESTORE OUR PC TO AN OLD (YEARS BACK) RESTORE POINT? (Vista/7 etc gives option to create a Recovery Disk, good). But in XP, eventhough we create a restore point, after many years if the computer reaches in a worst level by long use, and then we need to go back to its initially saved restore point, the old restore point is found lost! Is there any solution?